This whimsical Kokopelli night light shines bright in the darkness. Made from metal and finished by our artists, this is an affordable and functional piece of art. Comes with a bulb, ready to plug into any outlet. Kokopelli night light is available in rust finish. Also available in the desert sun design which is shown below. Makes a lovely and affordable gift. 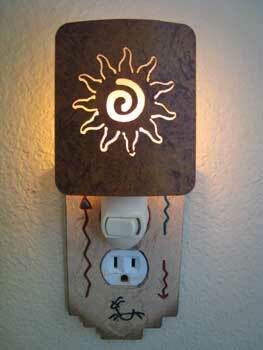 Order your Kokopelli night light today.